Technicians are currently inspecting all lines and conducting a damage assessment. An 18-year-old Lawrence man was killed in Thursday night’s explosion when the chimney from a nearby house fell on his car. Safety officials report more than 60 suspected gas fires erupted in the three communities, injuring at least 25 other victims. The NTSB said over the weekend it was looking at the records and operating procedures of Columbia Gas of Massachusetts. Joe Hamrock, chief executive officer of NiSource, parent company of Columbia gas, said the company would take full responsibility base on NTSB findings, according to multiple media reports. At least a dozen families were permanently displaced and other impacted homes remained without natural gas service. Additionally, the Lawrence school system remained closed Monday as officials continued to work to restore gas and electricity. Massachusetts Governor Charlie Baker said police and fire personnel, as well as 120 utility representatives, will be on standby as people return to their homes.. Residents should contact authorities if they smell gas, or notice fire-related damage or anything odd with their gas appliances. Baker declared a state of emergency Friday and said New England-based Eversource would replace Columbia Gas as the lead utility in the recovery efforts. On Sunday, Columbia Gas turned away hundreds of Lawrence residents who wanted to make damage claims because it couldn’t handle the deluge, The Boston Globe reported. Investigation into the cause of the explosion and fires will focus on reducing the risks going forward. It will not seek to compensate victims for losses. Victims should consult a Boston personal injury law firm experienced in personal injury, premises liability law, as well as negligence claims against large public agencies, including school districts and utilities. There have been several high profile explosions impacting Massachusetts employers and communities in recent years. In June, we reported serious injuries after a propane tank explosion. Earlier this summer, two firefighters and a resident were reported injured in a home fire. In other cases, car fires and fires at work have causes serious or fatal injuries throughout New England in recent years. As have multiple firework injuries. While authorities do not believe the incident was caused intentionally, a full report on the exact cause may not be complete for up to two years. Governor Baker has been critical of Columbia Gas’ level of preparedness. National Transportation Safety Board Chairman Robert Sumwalt said that a pipeline controller in Columbus, Ohio, noticed a pressure increase in a pipeline in Lawrence. Identifying all responsible parties and determining liability for the surge in gas pressure and the resulting explosion and fires will be a complex technical and legal matter. Utility companies typically operate by using a large number of independent contractors, including third-party maintenance and repair companies that exist wholly or substantially to work on utility lines throughout the state. Involvement of a pipeline controller in Ohio illustrates just how complex these cases can be. Legal and practical requirements for personal injury lawsuits in these types of cases vary widely, depending on the facts and circumstances. For instance, premises liability or negligent security may be factors in a fire at an apartment complex, particularly if building owners or property managers have been made aware of dangerous conditions and failed to remedy them. In Boston, such dangers often exist in illegally converted rental units, where landlords have made multiple apartments of single family residents or otherwise divided living spaces without the appropriate zoning approvals. Blocked emergency exits or deficient fire escapes may also be to blame for evacuation delays that result in serious injury or death of occupants. Outdated or unsafe wiring or gas lines can also cause a fire or explosion. 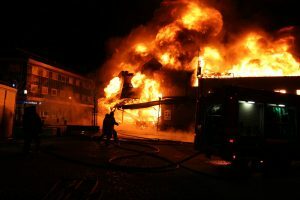 In the workplace, working with dangerous chemicals or explosive dust are common causes of fires or workplace explosions, as is inadequate ventilation. In these cases, a workers’ compensation claim will be an employee’s immediate avenue of relief. Workers’ compensation is a no-fault system designed to pay for medical expenses and a portion of lost wages if an employee is injured during the course and scope of employment. These benefits are paid regardless of fault. However, they will not compensation for all wages lost or other expenses, including some rehabilitative expenses and compensation for pain and suffering. In some cases, a third-party liability claim may be filed against liable third-parties other than a victim’s employer. These may include property owners, property managers, third-party contractors or others whose negligence caused or contributed to compensable injury. Public entities, like school districts and utility companies, also enjoy additional legal protections when it comes to liability claims. Consulting a Massachusetts law firm with extensive experience in this area of law will be vital to recovering all of the damages to which you may be entitled.